The Best Crochet blogs from thousands of top Crochet blogs in our index using search and social metrics. Data will be refreshed once a week. Also check out Crochet Podcasts and Crochet Videos from Top 100 Crochet youtube channels. 2.10 Whistle and Ivy - Craft. Crochet. Create. 2.31 Bella Coco by Sarah-Jayne | Lifestyle, Crochet and Craft Blog. 2.73 Hooking is a Lifestyle | Easy To Follow Crochet Patterns! 2.78 Connie's Spot© Crocheting, Crafting, Creating! 2.80 damn it Janet, let's crochet! 2.95 Little Yarn Friends | Rachel H’s Amigurumi, Crochet & Crafts. Crochet newsletter is a comprehensive summary of the day's most important blog posts and news articles from the best Crochet websites on the web, and delivered to your email inbox each morning. To subscribe, simply provide us with your email address. Ontario, Canada About Blog The Crochet Crowd is about community first. Led by Michael Sellick, aka Mikey. Our goal is to provide free resources such as crochet patterns, video tutorials and more. Facebook fans 1,214,212. Twitter followers 20,359. Iowa and the Intertubes About Blog If you love crochet, knitting, want to learn, or just want to see some great free patterns, come join the fun at Moogly! We've built up a highly interactive community of crafters and the blog is filled with lots of great information and free patterns! Facebook fans 347,578. Twitter followers 13,023. About Blog I Like Crochet magazine is dedicated to exclusively publishing the best crochet patterns, tutorials and articles from top designers. From crochet stitches to crochet scarf patterns to the granny square patterns, it’s all in I Like Crochet. Get the newest, best, completely exclusive crochet patterns and tutorials from the masters of crochet. Facebook fans 28,735. Twitter followers 628. Orange County, CA About Blog Blog by Sarah! The crafter, crocheter, and crockpotter behind the blog Repeat Crafter Me. As a wife and mom of 3 my days are busy but I always find time to pick up my crochet hook or indulge in something crafty. I share all my crochet patterns for free as well as post DIY projects, kids crafts, and crock pot recipes. A little something to inspire everyone! Facebook fans 241,275. Twitter followers 6,255. New Jersey About Blog Crochet blogger, designer, and teacher. Sharing my love of crochet at my blog. Run by Kara. Facebook fans 302,011. Twitter followers 7,615. Australia About Blog Blog run by Olivia Kent. You will find purely original crochet pattern designed with love! Facebook fans 71,628. Twitter followers 1,134. About Blog Crochet Classics for Today's Living. Run by Maria Bittner. Facebook fans 68,505. Twitter followers 3,116. Philadelphia, PA About Blog Crochet Spot is a blog where you can find: -Crochet patterns (free and for sale) -Tutorials on crochet stitches and techniques -Crochet News -Fun crochet discussions. Run by Rachel Choi. Facebook fans 41,574. Twitter followers 6,555. 10. Whistle and Ivy - Craft. Crochet. Create. About Blog Whistle and Ivy is a crochet blog (with lifestyle and food mixed in). I love designing crochet patterns and sharing them with you: my awesome readers! Crocheting is my passion, it relieves stress, it is a creative outlet, and it is a way to show my love for those around me. Facebook fans 95,849. Twitter followers 1,961.
my craft corner About Blog Amy Ramnarine is a freelance crochet designer and the owner/blogger behind The Stitchin' Mommy. Amy has been crocheting since 2009 and knitting on and off since 2010. Her blog consists of free crochet & knit patterns, crafts, recipes, book reviews, and so much more! Facebook fans 54,604. Twitter followers 5,578. Facebook fans 35,525. Twitter followers 2,291. About Blog Over 200 free knit and crochet patterns, videos, tutorials and charts from Kim Guzman. Facebook fans 46,412. Twitter followers 14,654. About Blog Amigurumi Today is for all who fell in love with cute crochet toys called amigurumi. Here you can find a lot of gift ideas and free amigurumi patterns. Here you will learn interesting ideas and lots of free amigurumi patterns and step-by-step tutorials. Facebook fans 79,962. Twitter followers 523. About Blog DIY craft news, reviews & ideas. Sewing to Knitting to Crochet. Even Edible Crafts & Polymer Clay! Facebook fans 406,836. Twitter followers 49,606. Reno/Tahoe About Blog A personal and business blog written by the owners and employees of the yarn shop Jimmy Beans Wool. Facebook fans 156,606. Twitter followers 14,238. Silicon Valley About Blog Life is busy and colorful and messy. Crochet and crafting is how I unwind and stay true to myself. I created One Dog Woof as a place for me to share tidbits of inspiration for anyone with a do-it-yourself attitude, filled with colorful crochet patterns and creative ideas for joyful living. Run by ChiWei. Facebook fans 28,552. Twitter followers 1,925. Facebook fans 467,104. Twitter followers n/a. About Blog A blog about crochet, design, tips and crochet techniques, including tutorials and free patterns. Run by Tatsiana. Facebook fans 27,436. Twitter followers n/a. About Blog Free-Crochet.com has free downloadable patterns and projects to create afghans and throws, baby afghans and clothing, holiday and seasonal crochet, children's toys and doll clothing, doilies and other crochet projects. Facebook fans 91,959. Twitter followers 2,979. About Blog Creating crochet patterns and tutorials is my passion. Making everything available for free makes me even happier as I can share my passion with anyone. Be sure to check out my newest crochet designs on my blog! Facebook fans 33,433. Twitter followers 180. About Blog All about crochet! Find original free crochet patterns and tutorials, stitch instructions, roundups and reviews of crochet patterns, giveaways, tips, tricks, inspiration and much more! Facebook fans 432,336. Twitter followers 7,663. About Blog Yarn Thing Podcast Host & Crochet and Knitwear Designer. Facebook fans 30,384. Twitter followers 9,606. NJ About Blog Jessie At Home features many free crochet & knit patterns & tutorials, along with some other crafts and occasional stories about being a mom of twins. Facebook fans 21,320. Twitter followers 2,257. About Blog Hi, my name is Esther and welcome to my blog! I am Dutch and live in The Netherlands. A little country on the west coast of Europe. This blog is mainly about crocheting, a real big love of mine. I aim to write on my blog once of twice a week, mostly about crochet related topics. Facebook fans 14,946. Twitter followers n/a. About Blog I love to crochet and sharing my passion by helping people learn to crochet. Do you love to crochet also? Or do you want to learn how to crochet? If so, I'd love to be able to guide you along the way with pattern designs, tips & video tutorials. Simple Crochet Designs & Patterns for Yarn Lovers. Facebook fans 14,982. Twitter followers n/a. About Blog Simply Crochet magazine is full of ideas for anyone who loves crochet! Facebook fans 468,094. Twitter followers 30,026. About Blog Hello and welcome! My blog started out of my love for crochet doilies and lace handkerchief edgings, but now you will find all kinds of crochet projects here. Run by Olga Poltava. Hesperia, CA About Blog Are you ready to look and feel elegant? ELK Studio provides quality crochet patterns that are easy to read and understand! Facebook fans 56,923. Twitter followers 2,205. 31. Bella Coco by Sarah-Jayne | Lifestyle, Crochet and Craft Blog. Nottingham About Blog This is a Multi Award Winning Lifestyle Blog with a focus on personal development, home life and creative living. Facebook fans 26,796. Twitter followers 3,837. About Blog A blog about crochet patterns and techniques, family and life. Includes free crochet patterns and tutorials. Run by Susan Carlson. Facebook fans 35,749. Twitter followers 1,322. Savannah, Georgia About Blog Beginner Crochet instructions, free video tutorials, patterns and written instructions. Learn to crochet. Facebook fans 106,011. Twitter followers 10,655. TX About Blog Simply Collectible Crochet officially began in October 2010 after using crochet as an escape to regain my sanity from staying home with a toddler who was learning to read, but had a very strong personality and sensory sensitivities. My patterns are clear, concise, full photo tutorials to make your labor of love more lovely. That is why I give you the most concise patterns possible. Facebook fans 32,571. Twitter followers 1,170. About Blog Crochet blog run by Cylinda Mathews. Step into a world of crochet. I specialize in designing crochet patterns for every occasion and offer hundreds of patterns for digital delivery. Follow my blog for free crochet patterns! Facebook fans 15,404. Twitter followers 878. Manchester, England About Blog Brand new UK crochet magazine, gorgeous crochet patterns and inspiration. Facebook fans 17,449. Twitter followers 1,913. Facebook fans 8,588. Twitter followers 90. Canada About Blog MJ's Off the Hook Designs is your one stop for crochet information, projects and patterns. Specializing in Crochet patterns, kits, luxury yarns and finished products! Facebook fans 157,202. Twitter followers 547. Spokane, WA About Blog Welcome to Two Hearts Crochet! Here you'll find tips, tricks, tutorials and patterns for both crochet and knit yarn crafts. If it's crafty or geeky, I'm all about it! Use the menu above to view recent blog posts, scroll through available patterns, check out our upcoming CALs, and lots more! Facebook fans 12,855. Twitter followers 271. Facebook fans 520,942. Twitter followers n/a. Facebook fans 107,206. Twitter followers 19,550. About Blog Crochet Projects, Patterns and Ideas. Facebook fans 20,739. Twitter followers 1,742. Facebook fans 83,793. Twitter followers 89. About Blog Crafternoon Treats: sharing crochet inspiration. Free crochet tutorials, new crochet designs, bunting, crochet bags, crochet flowers, you name it its here! Facebook fans 18,545. Twitter followers 528. Cleveland, OH About Blog Here you will fins crochet Patterns, Tutorials and Projects, reviews and more. Facebook fans 21,352. Twitter followers 129. Australia About Blog Crochet Australia specializes in all things crochet. We aim to provide crochet information and a wide range of quality crochet books, hooks, threads and crochet supplies at an affordable price, not only to Australian crocheters, but to crocheters all over the world. Facebook fans 2,369. Twitter followers n/a. About Blog Gorgeous, fun and easy to read crochet patterns. American Crochet provides crochet patterns for the novice to the expert crocheter. Run by Mistie. Facebook fans 8,381. Twitter followers 3,339. Raleigh, NC About Blog Run by Leslie Stahlhut. This page documents my adventures in crochet and all of the interesting things I learn along the way. Facebook fans 3,082. Twitter followers 2,677. United States About Blog Cream Of The Crop Crochet was started by crochet designer, Ashley Carr in 2014. Cream Of The Crop Crochet is a blog with easy, free crochet patterns and video tutorials, with a warm country style, where Ashley's personality shines. Come back to crochet with Ashley everyday! Facebook fans 20. Twitter followers 635. About Blog At http://www.divinedebris.com/ you can find bits about my life and crochet, in the form of links and patterns. I seek to have fun and inspire through crochet. A blog by Amber. Facebook fans 4,207. Twitter followers 354. About Blog A crochet blog with original and beautiful crochet projects and patterns. Facebook fans 136,380. Twitter followers n/a. About Blog My name is Sonja van der Wijk and I am a Dutch crochet animal pattern designer and illustrator. I love what I do. Here at my blog you can find crochet patterns to make lively crochet animals and so much more. Czech Republic About Blog Colorful world of crochet designs, patterns, ideas for handmade gifts, toys and home decor. Facebook fans 510,508. Twitter followers 459. Facebook fans 4,277. Twitter followers 1,964. About Blog If you are after unique crochet patterns for children (and adults) then visit my blog. I share my latest crochet projects plus patterns for my crochet designs. About Blog Hello my dear friend! All my patterns are made by me with much patience, love and positive energy. I really am very positive person! I do LOVE crocheting and I really hope you will enjoy my patterns. I try to explain everything because I was also a beginner once. Facebook fans 100,804. Twitter followers n/a. Queensland, Australia About Blog Crochet patterns and video tutorials for original crochet appliqué designs. Facebook fans 683. Twitter followers 554. Mumbai, India About Blog Welcome to Sweet Nothings Crochet Blog where you can find Free Crochet Patterns ,my original designs and creations. 🙂 Over the years, I've found that there are a lot of free charts available on the net, so as I make the project off that chart, I write down my notes and share them here on my blog. Hope you enjoy it. Facebook fans 9,194. Twitter followers 161. Facebook fans 13,251. Twitter followers n/a. Houston Texas USA About Blog Hello and welcome to The Crochet Dude. I hope that others are inspired by the beauty and versatility of crochet. I hope that everyone feels welcome here and finds it a safe place to hang around. I hope that The Crochet Dude is an inspiration to children of all ages to pursue what hobbies they love. Teesside About Blog A craft blog about a Mummy who loves to crochet, knit, quilt, sew, weave and occasionally bake. Includes crochet tutorials and patterns. Run by Sandra. Facebook fans 17,432. Twitter followers 577. United Kingdom About Blog I’m the owner of Keep Calm and Crochet On UK; a happily married, full time working mum with two beautiful little girls. With a hectic lifestyle the one thing that keeps me sane and calm is crocheting. Facebook fans 14,342. Twitter followers 521. About Blog Sweet Potato 3 designs crochet patterns for everyone, participates in charity events, host Crochet - A - Longs, and enjoys the long lost craft of crocheting with fiber yarns. Facebook fans 20,468. Twitter followers n/a. About Blog Better crafts with Lyn's Crafts. Cotton Yarn, Monaco Crochet Thread, Lizbeth Crochet Thread, Crochet Flower Patterns and Decor, Crochet and Knitting accessories. About Blog A crochet resource that includes free crochet patterns, crochet tutorials, crochet printables, and much more. Facebook fans 830. Twitter followers 115. About Blog A blog about crochet and crafts including free patterns, ideas, and tutorials. Facebook fans 24,283. Twitter followers 782. About Blog Bonita Patterns Blog, your source for the mot beautiful original crochet patterns, and many are free! Facebook fans 51,253. Twitter followers n/a. Utrecht - The Netherlands About Blog The best crochet patterns and sewing tutorials. Hop on over to Happy in Red, it's time to create. Facebook fans 7,235. Twitter followers 955. About Blog A blog of free crochet patterns for premature and angel babies, as well as free printables, sewing and craft tutorials, and crochet patterns. Facebook fans 6,207. Twitter followers 21. About Blog Wife, mother, blogger, crochet lover, author of Beginner's Guide to Crochet and Extreme Crochet. Links to patterns, tutorials and everything else on my blog. Facebook fans 4,141. Twitter followers 863. About Blog Sharing my own crochet adventures, and hoping others will join me! Especially hoping to inspire absolute beginners who would love to learn but were certain it just looked too difficult. If there's a will then there is a hook and some lovely yarn just waiting for you to turn it into something lovely. Facebook fans 3,700. Twitter followers n/a. 73. Hooking is a Lifestyle | Easy To Follow Crochet Patterns! About Blog Mother of three, loyal girlfriend, Internet savy and a tech junky! Discovered crochet more than 3 yrs ago and completely fell in love with the craft! Facebook fans 862. Twitter followers 2,828. Australia About Blog A happy mix of craft, creation and chaos! Crochet, Knitting, Sewing, Quilting, Baking, Cooking, Parenting, Gardening and Tasmania. Facebook fans 691. Twitter followers 220. Houston, TX About Blog This blog features, Crochet Inspiration, Free Crochet Projects and Items, DIY Tutorial & Patterns to share and Outfit posts as well. Run by Ashlee Elle. About Blog Free crochet and crafting patterns, mostly made of yarn. Checkout the free patterns section. About Blog Hi there! We are Michelle and Anne and we share this blog! We have been friends for ages even though we live in different sides of the world (Australia and Germany). We share a common passion which is crochet (hence the blog name) but we blog about Australia, Germany, food and other stuff we like too. Facebook fans 2,301. Twitter followers n/a. 78. Connie's Spot© Crocheting, Crafting, Creating! USA About Blog Welcome to Connie's Spot!! Now You Can Follow Connie's Spot and Get Free Recipes, Free Patterns, Specials, Giveaways, and Much More!! Facebook fans 1,755. Twitter followers 877. Lynton, Exmoor. About Blog Amanda Perkins crochet blog, including crochet blankets,designs and patterns. Ramblings about all crochet blankets, designing, wool, colour, inspiration and our life on Exmoor. Visit Amanda Perkins crochet blankets for Amanda's crochet patterns, gallery's, blog and much more. Facebook fans 5,988. Twitter followers 1,922. 80. damn it Janet, let's crochet! About Blog Unique crochet patterns and designs for you and your home. You'll find a variety of crochet creations. All my patterns are written in American English terminology and many have various pictures to guide you trough them. I hope you will make our home on the web a regular stop for your patterns! Facebook fans 6,931. Twitter followers n/a. Cheshire About Blog My name is Lynne Rowe and I'm a knit and crochet fanatic. I can't imagine a day without picking up my needles or hook and creating something fab and funky. I design for many UK knitting magazines and publications, including Let's Knit, Let's Get Crafting, Knit Today, Inside Crochet, Woman's Weekly and Homemaker. I also teach knit and crochet locally in Cheshire. Facebook fans 615. Twitter followers 1,562. Texas About Blog A collection of original crochet designs. Run by Melinda Miller. Facebook fans 6,521. Twitter followers 187. About Blog Crochet Craft and Mummy blog. Facebook fans 4,134. Twitter followers 1,778. Montespertoli (Firenze) About Blog The Official Blog of the Crochet Guild of America. The main purpose of the Crochet Guild of America is to educate the public about crochet, provide education and networking opportunities, and set a national standard for the quality, art and skill of crochet through creative endeavors. Facebook fans 107,084. Twitter followers 2,503. About Blog To crochet funny, unique, and tasty looking accessories for you and your stuff! Facebook fans 25,409. Twitter followers 11,275. Ohio About Blog The central home for Ellen Gormley's crochet patterns, video tutorials, free patterns, crochet career coaching, inspiration, motivation and more! I design beautiful, easy crochet patterns that help you save money, use affordable yarns, give amazing gifts, and add relaxation and confidence to your life. Facebook fans 4,494. Twitter followers 12,990. About Blog I taught myself to crochet in August 2016 in honour of my Grannie, Mabel Eileen. I have fallen in love with crochet and I’m passionate about creating new things, adapting patterns to make them unique to me and I’m venturing out into the world by creating my own patterns too. This page is to further honour my Grannie and share my love of crochet with as many people as possible. Facebook fans 3,594. Twitter followers n/a. About Blog Hello all!!!! A warm Welcome and Its a pleasure to have you here where I share my passion for handmade Arts and Crafts.I love experimenting new and creative ideas. Would love to hear from you. Facebook fans 3,175. Twitter followers n/a. Facebook fans 903. Twitter followers 13. UK About Blog Adventures in knitting and crochet. Run by Juliet Bernard. Facebook fans 577. Twitter followers n/a. About Blog My crochet life and more. PA, US About Blog Stay tuned with outstanding crochet designs from around the world for your inspiration. Run by Natalia Kononova. Facebook fans 37,676. Twitter followers 95. 95. Little Yarn Friends | Rachel H’s Amigurumi, Crochet & Crafts. About Blog I’m Rachel, living in sunny Singapore. A lover of artsy-craftsy things ever since I was a kid. I am a self-taught crochet-amigurumi artist. I picked up some helpful crochet skills from the Internet all thanks to other talented crochet artists from all over the world that are so generous and willing to share their knowledge. Facebook fans 12,865. Twitter followers 447. About Blog My Crochet works and Patterns - A studio for people with a taste for yarn! Run by Ingunn Santini. Facebook fans 4,102. Twitter followers n/a. About Blog I’m a Happily Married Mom. I crochet as often as I can and I love making up new designs in crochet. I enjoy crocheting, knitting, drawing, painting, painting on ArtRage and working on Photoshop. My grandmother taught me crochet when I was 7yrs old, I am self-taught in knitting and on Photoshop, and my art education is all through my school career, from elementary through high school. Bloomington, IN About Blog These days I am focused on selling my hand made crocheted items. I personally crochet or craft all my items and take pride in my work. I will customize anything to your needs. I also make jewelry and do some sewing for kids clothes. If you see something you want made and it's not already for sale just message me and I will reply quickly and try to meet your every need. Facebook fans 509. Twitter followers 824. North Carolina About Blog Welcome and thank you for stopping by. I'm Elizabeth and I am a mother, wife, and social worker. I love to crochet and knit. I started this blog as a way to share the patterns new and old. I hope to offer color inspiration and patterns for free with as many crafty people as possible. Denver, CO USA About Blog Discover a world of new crochet techniques, skills for making gorgeous crochet garments and more, with the Craftsy Crocheting Blog. Facebook fans 7,622. Twitter followers 42. CONGRATULATIONS to every blogger that has made this Top Crochet blogs list! 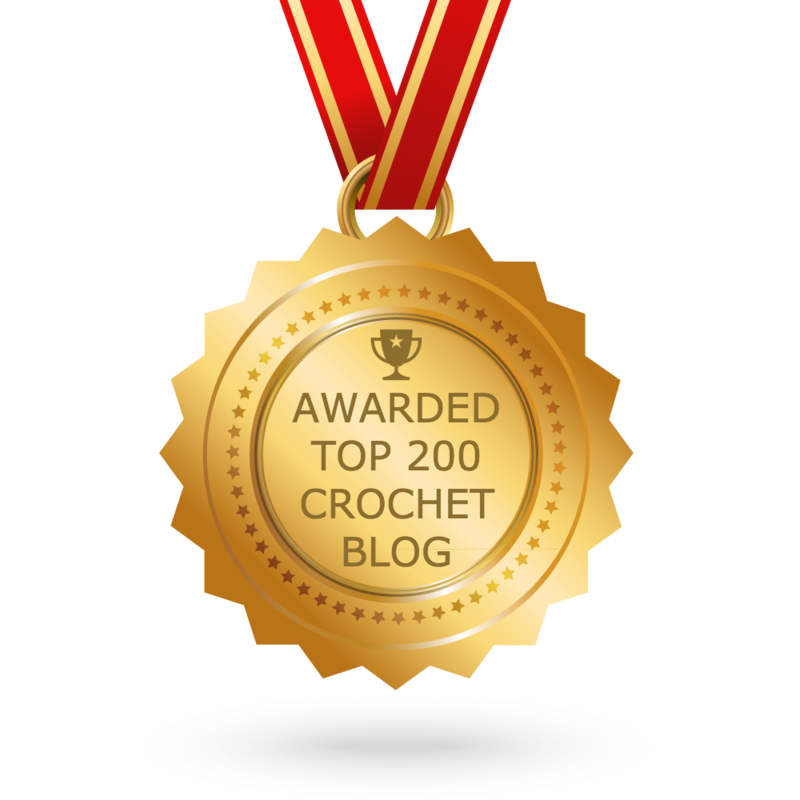 This is the most comprehensive list of best Crochet blogs on the internet and I’m honoured to have you as part of this! I personally give you a high-five and want to thank you for your contribution to this world.